In 1805, the world of music was startled by an avant-garde and explosive new work. Intellectually and emotionally, Beethoven's Third Symphony, the "Eroica," rudely broke the mold of the Viennese Classical symphony and revealed a powerful new expressiveness, both personal and societal. Even the whiff of actual political revolution was woven into the work-it was originally inscribed to Napoleon Bonaparte, a dangerous hero for a composer dependent on conservative royal patronage. With the first two stunning chords of the "Eroica," classical music was transformed. 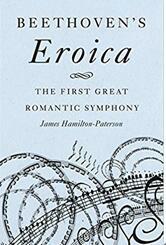 In Beethoven's Eroica, James Hamilton-Paterson reconstructs this great moment in Western culture, the shock of the music and the symphony's long afterlife. James Hamilton-Paterson is one of Britain's most distinguished-and reclusive-writers. A travel writer, memoirist, poet, and award-winning novelist, Hamilton-Paterson is also an accomplished musician. His novel Gerontius won a Whitbread Prize and his many books include the bestselling Empire of the Clouds, Marked for Death and Music: Stories. He now lives in Austria.